Dorset Lookout Tower - from underneath. 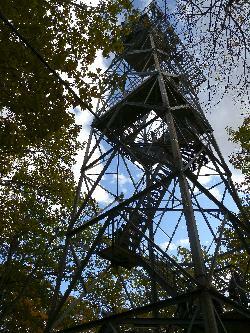 View of Dorset Lookout Tower from directly below it. The original tower was built in 1922, was 25 metres high (82 feet) and used as a fire lookout tower. The current tower was built in 1967, is 30 metres high (100).